These bright Yellow Calcite Spheres are from Mexico. Calcite has long been used as an energy amplifier and yellow symbolizes the energy of the mind, encouraging an openness to learning and higher thought. The Oriental Wood Stand is included. Hard to find Blue Calcite spheres from Madagascar have beautiful blue hues! Calcite is said to heighten cosmic awareness and enhance study. 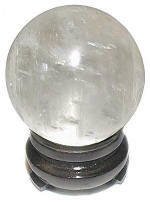 These special spheres are smooth and do not have the natural chips or cracks that is common with polished Blue Calcite. The Oriental Wood Stand is included. 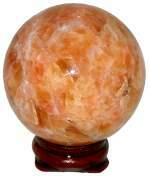 Bring home a bright sunny day with this luscious Orange Calcite Sphere from Mexico. Calcite crystals are highly bi-reflective, that means light is reflected in two different directions. This property gives Calcite a semi-translucent sheen with sparkling reflections. 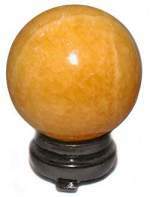 AA Grade with translucent deep color Mexico Orange Calcite sphere comes with an Oriental Wood Stand. Fluorescent in UV light, Mangano Calcite also has a breathtaking semi-translucent pink glow in sunlight! 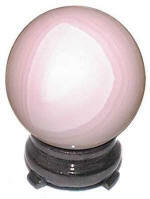 This fast disappearing stone from Peru, has beautiful banded variations of intense to very pale pink formations. It has a very fine, smooth polish and comes with a Oriental Wood Stand. Bring home a bright sunny day with these gorgeous Madagascar Orange Calcite Spheres, some with Black Tourmaline rutile. Calcite crystals are highly bi-reflective, that means light is reflected in two different directions. This property gives Calcite a semi-translucent sheen with sparkling reflections. Calcite is said to increase the awareness and integration with the life force. 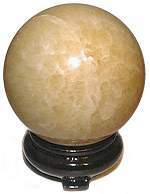 Highly polished and good color Calcite sphere comes with an Oriental Wood Stand. Superb quality, extra clear AA Clear Calcite spheres from China, the best source of high quality clear Calcite. The clarity is not easily captured in photo images because Calcite is double refractive stone. 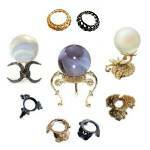 However you will be delighted with the exquisite clarity and light play from these great spheres. Calcite is said to increase the awareness and integration with the life force. Flawless polish and finish with no cracks. The Oriental Wood Stand is included. 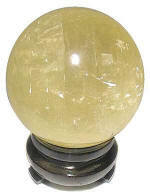 These beautiful Golden Calcite Spheres have good clarity and radiate golden rainbows in the light. Calcite crystals are highly bi-reflective, that means light is reflected in two different directions. This property gives Calcite a semi-translucent sheen with sparkling reflections. Calcite is said to increase the awareness and integration with the life force. The Oriental Wood Stand is included. These beautiful Green AA Calcite Spheres have good clarity and radiate golden rainbows in the light. Calcite crystals are highly bi-reflective, that means light is reflected in two different directions. This property gives Calcite a semi-translucent sheen with sparkling reflections. 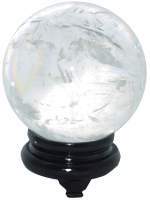 Highly polished and good color sphere comes with an Oriental Wood Stand. These superb Clear Calcite Spheres have good clarity and radiate rainbows in the light. Calcite crystals are highly bi-reflective, that means light is reflected in two different directions. This property gives Calcite a semi-translucent sheen with sparkling reflections. Calcite is said to increase the awareness and integration with the life force. 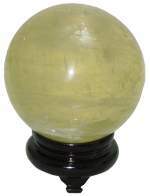 Highly polished and good color sphere comes with an Oriental Wood Stand.